You can get your ebook or print copy of Arabesque, my fourth poetry collection. To order a signed copy, write to me viaa the Contact Form. The poems in Arabesque draw parellels between arabesques in dance and calligraphy, tracing the nuances in relationships with fathers, brothers, and partners. 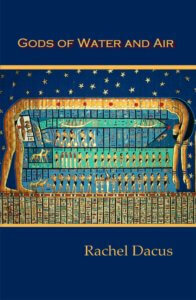 With fearlessness and curiosity the poems delve into death, love, and creativity. There are lightere themes too. Giraffes in the living room and dead-drunk superheroes! Humor and sorrow illumine and ground the writing in light and earth. 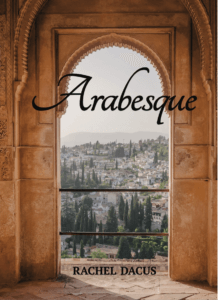 I’m thrilled by Maria Rouphail’s review of Arabesque in The Pedestal Magazine. Having my poetry compared to Rita Dove’s is exhilarating! slung low to the water to catch tuna. the breaks in my spine. Arabesque penchée. Anatomy is destiny. and went onstage to family cheers. until the weeping notes rose in their brief solos. out on the music as if I were the violin string. 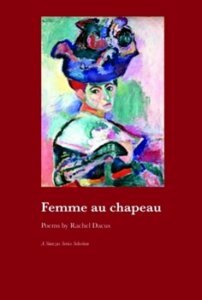 “Rachel Dacus directs her steady gaze on art’s meticulous and sometimes maddening labor, on the deep grief and explosive beauty of a daughter’s attachment to her fading father, and on love’s latent withering and re-blossoming.” – Deema Shehabi, author of Thirteen Departures from the Moon. “Rachel Dacus turns a painterly eye onto both the nooks and crannies of our world, ‘hints of rose madder in the cerulean,’ a palm tree’s ‘rigid, rattling arguments,’ and ‘the blue immensity’ that holds us all.” – Molly Fisk, author of The More Difficult Beauty.